CGC Mould Resistant Fiberglass Drywall Tape is designed to provide increased moisture and mould protection. It is self-adhesive which makes joint finishing simpler and quicker. For the first coat, a CGC Sheetrock<sup></sup> or Dura bond<sup></sup> Brand Setting-Type Joint Compound is required. The second and third coat may be finished with a CGC Ready-Mixed Joint Compound. The tape meets the highest rating, on the ASTM D3273 mould test. 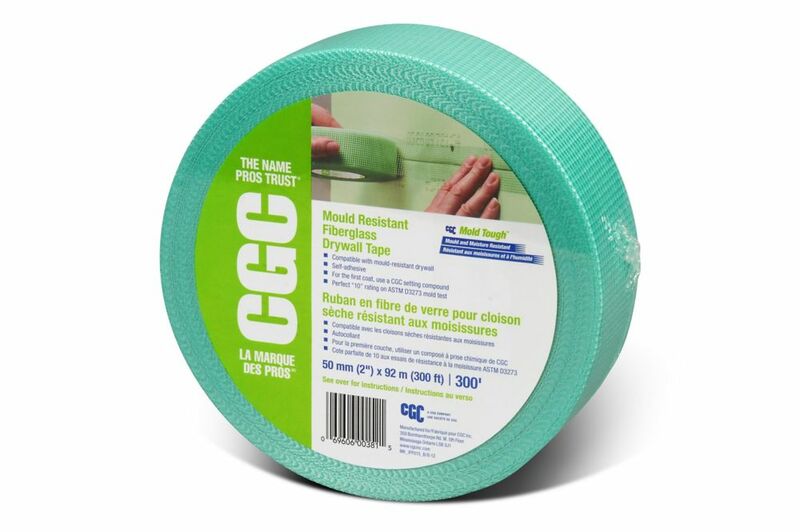 CGC Mould Resistant Fiberglass Drywall Tape is the ideal complimentary product to CGC Sheetrock<sup></sup> Brand Ultra Light Panels Mold Tough<sup></sup>. When combined they form a complete, compatible, mould-resistant system. CGC warrants that all products are free of defects in materials and factory workmanship. Some products carry more specific warranties. All other warranties are excluded. See www.cgcinc.com for installation instructions and other details. CGC Strait-Flex Drywall Corner Flex Tapes form easily to all angles and corners. Will not shrink, blister, tear, sag or wrinkle. Material can be second coated immediately. Does not require fasteners, stapling or any special tools. Slotted edges ensure superior bond. Specialty Tapes Designed for Maximum Performance in Specific Applications. The FibaTape family of products includes a complete range of ground-breaking drywall joint tapes for professionals and DIYers. This line includes self-adhesive fibreglass mesh tapes . These high performance products, designed to be easier, faster and stronger, deliver excellent value and performance. Gorilla Tape has taken duct tape to a new level. Gorilla Tape's toughness surpasses ordinary tapes, making the list of uses virtually endless. It sticks to rough and uneven surfaces, including wood, stone, stucco and brick, that ordinary tapes can't hold. MASTERS YELLOW T-TAPE seals all metal and plastic threaded connections against leakage at temperatures from 400F to +600F (-240C to +316C). Because it is chemically inert, MASTERS YELLOW T-TAPE is impervious to virtually everything. It is a high density T-Tape that is ULC listed for Natural Gas and its yellow colour makes it easily identifiable for use with gas lines. Fiberglass Mould Resistant Drywall Tape, 2 in x 300 ft Roll CGC Mould Resistant Fiberglass Drywall Tape is designed to provide increased moisture and mould protection. It is self-adhesive which makes joint finishing simpler and quicker. For the first coat, a CGC Sheetrock<sup></sup> or Dura bond<sup></sup> Brand Setting-Type Joint Compound is required. The second and third coat may be finished with a CGC Ready-Mixed Joint Compound. The tape meets the highest rating, on the ASTM D3273 mould test. CGC Mould Resistant Fiberglass Drywall Tape is the ideal complimentary product to CGC Sheetrock<sup></sup> Brand Ultra Light Panels Mold Tough<sup></sup>. When combined they form a complete, compatible, mould-resistant system.